Over the years I have collected a small number of books I consider true treasures. These books represent the rare book and manuscript subset of my private library. Some of my treasures were acquired after careful study of the market and exhaustive search for the right copy at the right price. Other titles were acquired as impulse buys, books I just had to have! 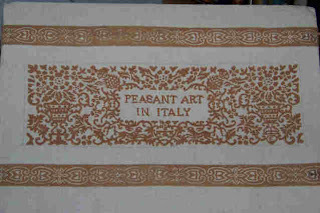 One such book is Peasant Art In Italy, Text and Original Woodcuts by Eleonora Gallo, English Translation by C. D. Tassinari, published by Giulio Giannini and Son, Florence, Italy, 12" x 18", edition limited to 250 numbered copies, copy number 162, published April 1, 1929 (114 l. incl. col. 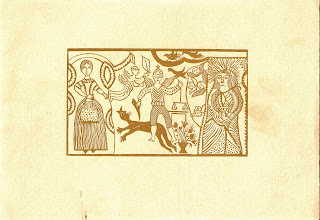 illus., XXXIII col. pl. 31 x 45 cm). I acquired my copy in October of 1996 while on my honeymoon with Anne at a rare book shop in Florence, Italy. Somewhere, we still have the receipt of the purchase. The discovery and acquisition of this book was an unplanned and memorable event. Anne and I were wandering the streets of Florence after four days in Rome and I had yet to buy a book. One of my traditions while traveling is to always buy a book, new or used, collectible or simply desirable. Exploring Florence is a book lover's paradise. We had visited the Laurentian Library and the Library of San Marco along with the numerous outdoor stalls hawking the various specialities of Florence. On this day we had visited a proper Florentine tile shop and were seriously considering the possibility of buying a lot of antique ceramic tiles for a planned remodel of our downstairs, including the floor of the library. The calculation of cost and shipping expenses made that decision easy to make, a simple no go. 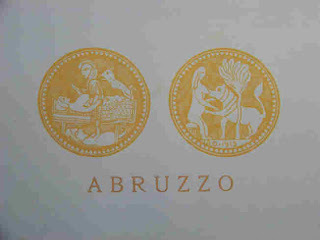 At that point our hearts and soul were sold on acquiring some special item in Florence and we entered the rare book shop. Neither Anne nor I read Italian but browsing antiquarian books sometimes requires simply a sense of adventure and a willingness to experience the true wonder of rare and finely crafted books. 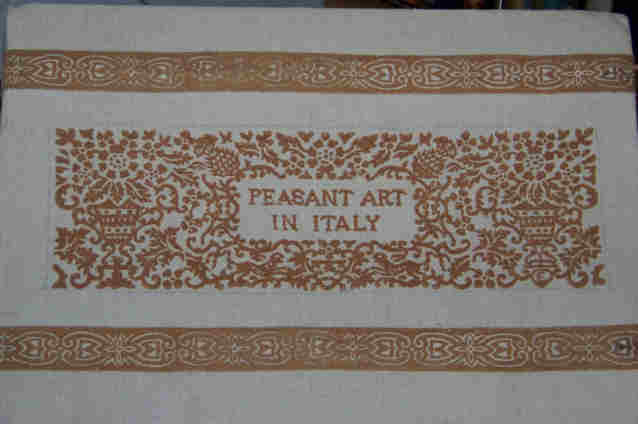 As we were browsing we both saw the title, in English, Peasant Art In Italy. The shear size of book first caught our attention and the linen cover finely decorated with an obvious peasant design invited us to browse. 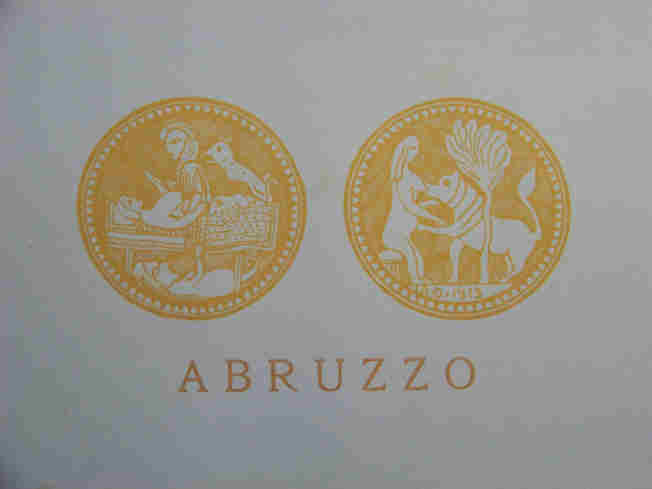 We quickly fell in love with the content, a tour of peasant art wonderfully illustrated and reproduced in numerous woodcuts covering all the regions of Italy, including my mother's ancestral region, Abruzzo-Molise (since the 1960's Abruzzo and Molise separated). We agreed in an instant that we needed to add this book to our library. This is a treasure for many reasons. First and foremost it is always a reminder of the joy we experienced on our honeymoon in Italy, my first trip and Anne's 3rd. Second, this is an amazing book based on content and design. 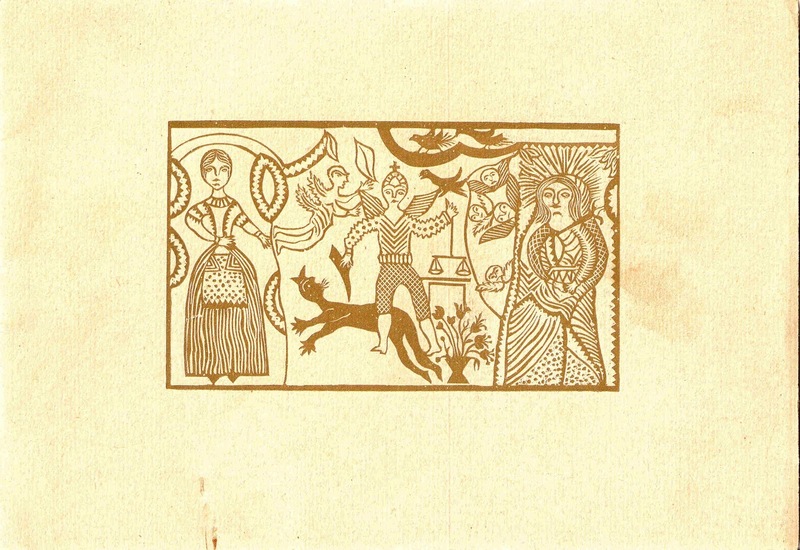 The large page size supports the woodcut illustrations of the peasant art traditional throughout Italy and the examples are perfect for creating stencils for home decoration or embroidery projects. My Italian heritage dominates my personality and this book offers a unique history of the regions of Italy and how each region approached and pursued the arts. After yet another Church and/or museum, exploring Italy through the eyes of the peasant is a breathe of fresh air. In 2010 I was doing some research on this title and made a secondary discovery that is as amazing as the book itself. While searching for available copies in order to place a value on my copy, I discovered that a bookseller in Ohio was selling the actual sales brochure from 1929 for this book, a 10" x 7", 12 page folio with facsimile reproductions from the master work. For a few dollars in 2010, I now own both the sales brochure and the book. Today there are 15 known copies held by libraries participating in World Cat.org and 5 copies for sale in the rare book marketplace. The asking price ranges from $180 to $550 and there are two copies available that include the original illustrated box. I am missing the box and the wooden clasps, mentioned in the brochure. The linen cover is in great shape. While this is not priceless it is, nonetheless, a treasure. Always has pride of place in the library display. Special to see everyday. I swear I WILL do an embroidery using some of the motifs...maybe I will start this week! I was searching for information regarding this beautiful book when I came across your blog entry. Thank you for sharing your experience and providing so many wonderful details regarding the publication. I too treasure my Italian heritage and travel annually to Italy in search of my soul which always seems to remain there when I depart. I am also an embroiderer and LT member and will search for your profile. 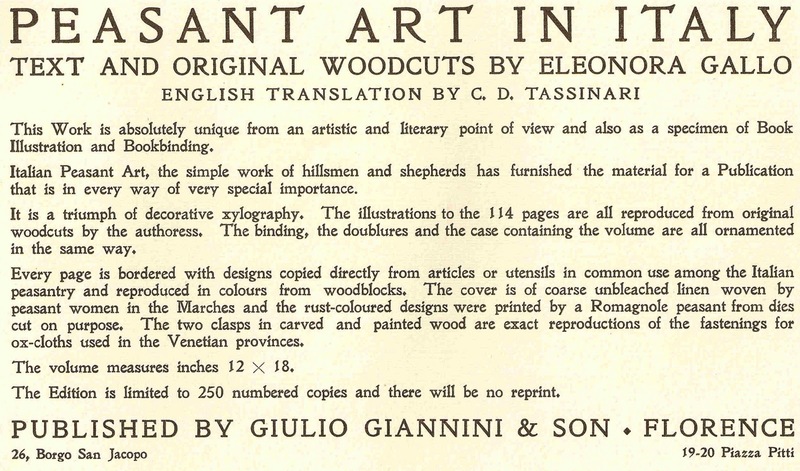 Now to find more details on Eleanora Gallo and hopefully obtain a treasured copy of the book. Grazie per tutto. I received book #39 of the 1929 edition of 250 as a gift years ago. It's in good condition. 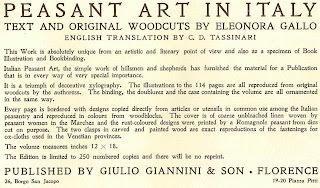 I've enjoyed reading the hand set text and, as an artist, appreciate the variety of wood cuts. The paper has some discoloring which I assume is common to all copies of this edition. My copy has no art on the cover and the title is stamped in gold on the leather straps. I don't know if it qualifies as a treasure, but it's something I do appreciate.